Schedules for these trials can be downloaded from The Scottish Kennel Club or The Working Trials Monthly websites or contact Bob Russell, Sonachan View, Portsonachan, Dalmally, Argyll. PA33 1BJ with an s.a.e. Further information can be downloaded from Kennel Club website where the I -Regulations can be seen and purchased. These regulations are those which are relevant to Working Trials. 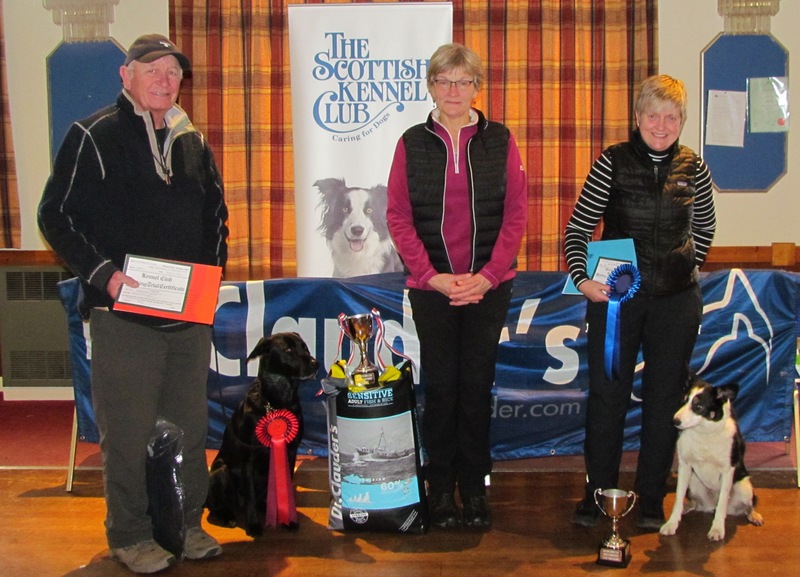 Scottish Kennel Club Working Trials. Working trials take place throughout Scotland, either on moorland or farmland and is open to all Kennel Club registered dogs, large or small. Emphasis is placed on tracking which varies in length and time progressing through the stakes depending on the dogs qualifications. Dog and handler are judged as a team, it is a very friendly sport as all dogs in a stake can qualify if a pass mark is achieved, any placings are the icing on the cake! Small dogs have reduced jump heights. Qualification at an Open trial entitles the competitor to enter a Championship trial where on completion of a successful round an owner can add the letters of each stake to the dogs name along with the grading. The usual classification would read as C.D.Ex (meaning Companion Dog with an excellent grading)to be followed by U.D.Ex, W.D.Ex, T.D.Ex P.D.Ex. All dogs must be at least 18 months to compete. The first stake, the COMPANION DOG (C.D.) is the only stake that has not any tracking. It consists of Search Square, ( 3 articles are placed in a 15yd square) Heelwork: On and Off lead. Fast, Slow, and Normal Pace. Recall. Retrieve a dumbbell. Sendaway. Sit Stay, Down Stay, Clear Jump, Long Jump and Scale Jump. A tracklayer walks across the ground causing scent to be left from crushed grass etc. they leave articles (number and size depend on the stake) for the dog to indicate. Some of these have to be found. The handler works the dog on a harness and line, a pole at the start shows the direction of the first leg of a track, the length varies per stake from a possible 6 legs to 25 legs of varying length and time. Length and direction of tracks are at judges discretion but must be the same for each dog in the same stake, the ground must also be the same for all in the stake. The Search Squares are all 25yds, with 4 articles for the dog to find in 5 minutes. Size varies according to the stake but are approximately the size of a matchbox. Points are awarded for teamwork. Heelwork is off lead with no commands apart from starting after a halt. Normal, slow and fast pace are all required. The Retrieve of a dumbbell is replaced in the T.D. stake by a Speak on command. The Sendaway has the addition of a Re-Direct in T.D. The other components in the control section are Clear, Long, and Scale Jumps and a 10min. Down stay out of sight. The Clear jump is 3ft, Long jump is 9ft and the Scale 6ft. Smaller dogs have the heights adjusted. In some cases a second attempt may be given for half points. Some element of the jumps must be completed to qualify. The best way of finding out about trials is to visit one of our trials to see what is entailed and to meet a friendly crowd willing to help newcomers to our sport.